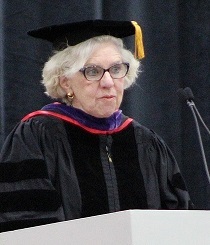 Smith Duggan Buell & Rufo managing partner Barbara Hayes Buell delivered the alumni address at the Boston University School of Public Health graduation on May 19. Her welcoming remarks were titled, “Live the Algorithm of Your Life.” She addressed a commencement audience of 1,200 graduates, faculty, alumni, and family members. 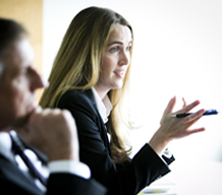 Ms. Buell is one of the foremost healthcare lawyers in the Commonwealth. She represents doctors, nurses, hospitals, dentists and other healthcare providers on credentialing, contracting, licensing, HIPAA, professional negligence, residency programs, and numerous other legal matters. She also advises hospitals on matters involving patients with serious mental health concerns. To support her keen interest in health law, Ms. Buell earned a Master’s in Public Health at Boston University School of Public Health in 1994. She has been a dedicated supporter of the institution ever since. She told the graduates that at the School of Public Health she had learned, for example, what it would take to set up a healthcare outpost in Papua New Guinea and in the process manage the delivery of drugs and vaccines when there were neither roads nor electricity nor funds to launch such a project. In addition, a classmate showed her what it’s like to run an inner-city clinic. From another, she was exposed to the difficulties faced by midwives in rural Nepal. These experiences reinforced her continuing commitment to civil rights and social justice.